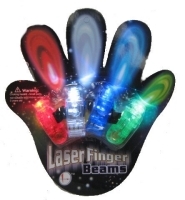 Laser Finger beams are great party accessories. 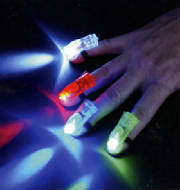 This 4 pack of Finger Lights is the versatile way to have light anywhere you point your fingers. Use them all together and create an amazing light show while you dance, or use just one at a time for safety or fun. Includes one each of white, green, red, and blue lights. The white light also makes a great micro flashlight to direct you through the darkness. Each Finger Light slips easily onto any size finger with stretchy silicone bands that match the light color. Each light features an on/off switch and uses 3 replaceable AG10 batteries (included). Each Finger Light is about 1.5" long and 0.5" height.